Oklahoma Attorney General Scott Pruitt at a Jan. 18 Senate Environment and Public Works Committee confirmation hearing for his nomination to lead the EPA. Pruitt's nomination passed in committee Thursday. He will still need to be confirmed by the full Senate. Committee rules say that two members of the minority party must be present for a vote, but chairman John Barrasso, R-Wyo., suspended the rules so Pruitt's nomination could pass the committee with only Republican votes, and he passed 11-0. Pruitt will still need to be confirmed by the full Senate, which appears likely. A Democratic aide from the EPW committee says they recognize that the move is "allowable under Senate rules" even if it's unprecedented for the committee. Upon reconvening the committee, Barrasso said: "It is disappointing that they chose that course of action. We will not allow it to obstruct." Hearings on Trump's nominee to run the Office of Management and Budget, Rep. Mick Mulvaney, R-S.C., were moving ahead Thursday morning. Pruitt has faced fierce opposition from Democrats. He sued the EPA as Oklahoma's attorney general and was asked during his confirmation hearing on Jan. 18 by Sen. Edward Markey, D-Mass., whether he would recuse himself from cases he was a part of. Pruitt's response was that he would "follow the guidance and counsel" of ethics lawyers at EPA, which was not a satisfying answer for Democrats. Democrats say they have not received full answers on Pruitt's record and positions. The committee's ranking member, Sen. Tom Carper, D-Del., sent a letter to Barrasso on Monday requesting more records from Pruitt's time as Oklahoma attorney general, as well as more complete answers on his positions regarding clean air and water regulations. "It's unacceptable and sets a dangerous precedent for the committee to allow him to stonewall on these important questions," said Sen. Jeff Merkley, D-Ore., in a statement from committee Democrats after the vote on Thursday. "This committee has conducted an extremely thorough and fair process of reviewing attorney general Pruitt's nomination," Barrasso said on Thursday. "That includes a hearing of unprecedented length, number of questions and timely responses from the nominee." In the past, Pruitt has questioned climate change. Here's what the EPA nominee told senators at his confirmation hearing: "Let me say to you, science tells us that the climate is changing and that human activity in some matter impacts that change. The ability to measure with precision the degree and extent of that impact, and what to do about it, are subject to continuing debate and dialogue. And well it should be." 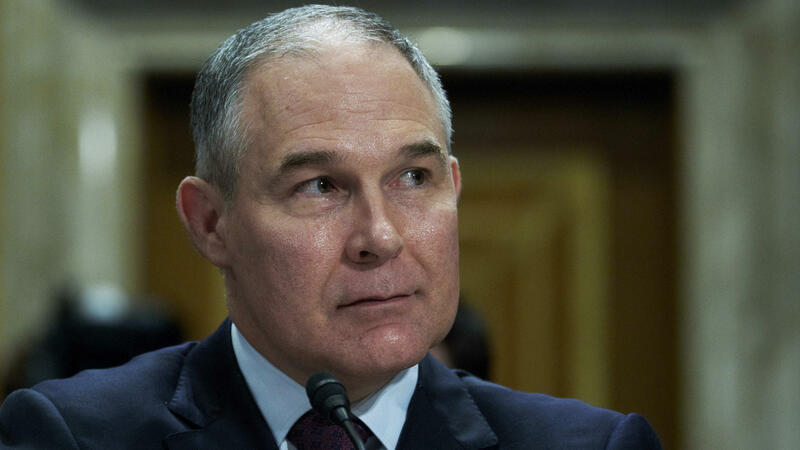 Democrats boycotted a hearing to vote on Pruitt's nomination Wednesday. Democrats on the Senate Finance Committee did the same to block votes on Trump's nominees to lead the Department of the Treasury as well as Health and Human Services earlier this week. On Wednesday, Finance Committee chairman Sen. Orrin Hatch, R-Utah, suspended committee rules to approve those nominees without Democrats present. Delaying nominees is the most Democrats can do. Due to rule changes in recent years, Cabinet positions can clear the Senate with a simple majority, as opposed to the 60-vote threshold required on most legislation and Supreme Court nominees — setting up a big fight in the months ahead of Trump's nomination of Judge Neil Gorsuch to replace the late Antonin Scalia. There is growing frustration among some Democratic voters that their leaders are not doing enough to block nominees. At a rally held Monday night by congressional Democrats to protest Trump's executive order to pause the entry of refugees from all nations and immigrants from seven majority-Muslim countries, some in the crowd demanded action in addition to the words being offered. "That's just like the Republicans did for Obama, only this time with a good cause. They should really be fighting for everything they can do to hold up the administration," Tom Johnson of College Park, Md., told NPR. In addition to boycotting committee votes, Democrats have delayed other Cabinet nominees on the Senate floor. Secretary of State Rex Tillerson was confirmed Wednesday night after Democrats forced two full days of deliberation. Without the filibuster, Democrats have been unable to block any Trump nominees so far. The only one that looks to be in serious trouble is Betsy DeVos, the nominee to lead the Department of Education. An advocate of school choice, she lost the support of Republican Sens. Susan Collins of Maine and Lisa Murkowski of Alaska on Wednesday. She has no support from Democrats, and if one more Republican opposes DeVos she will not be able to be confirmed.